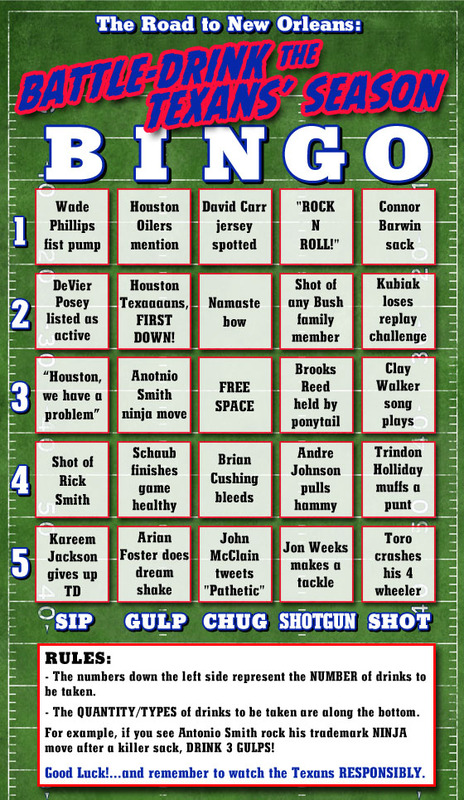 Houston Texans 2012 Preview Time: Our Bingo/Drinking Game Card, and Are the Texans "The Real" or "The Jobroni"? There's a reason why we ridicule Charlie Brown every time he falls for Lucy's tired "No really, this time I promise, I'm going to hold the ball in place while you kick, Charlie Brown!" We do it because we don't think it's humanly possible for people to fall for the same old tricks again (and AGAIN). So here come the 2012 Houston Texans, confident, battle-tested, and (most importantly) healthy. If there is an upstart Super Bowl darling, a team that hasn't been there before but many think they can now, it's your Texans. Keep in mind, they've done this to us before. After the 2008 season, a second straight 8-8 campaign, fans thought 2009 would finally be the team's first playoff season. Nope. After scrambling to finish 9-7 (but out of the playoffs) in 2009, the Texans became a chic Super Bowl dark horse in 2010. Um, REALLY nope. In 2010, the whole goddamn ceiling caved in. With moderately tempered expectations in a Peyton Manning-less AFC South, in 2011, the Texans finally came through for the first time in franchise history, making it to the divisional round of the playoffs on the arm of a fifth-round, third-string rookie in T.J. Yates. So is it now safe to buy in? Is this a new team with a new foundation and new leadership (on the defensive side of the ball, at least) that is built to last? Or is Lucy getting ready to pull the ball away from all of us yet again? In the words of the immortal WWE superstar the Iron Sheik (a must-follow on Twitter, @the_ironsheik), "Are the Texans the real or are they the jabroni?" The core on the offensive side of the ball has remained fairly consistent over that time frame with Andre Johnson (drafted in 2003), Owen Daniels (drafted 2006), Chris Myers (traded for in 2008), Duane Brown (drafted 2008), Kevin Walter (signed in 2006), Arian Foster (signed as an undrafted free agent in 2009) and, most importantly, Matt Schaub (traded for in 2007) serving as the nucleus. The defensive side of the ball has been a different story, requiring a couple of complete teardowns since 2008, the first when Frank Bush came in as another Kubiak "circle of trust" buddy hire, and then when Bush crash landed in a colossal David Carr-ian style fail, Wade Phillips was hired in 2011 to rebuild the Texans' defense practically from scratch. By season's end in 2011, Phillips had the third best defense in the league (up from 30th in 2010) with eight starters who began last season either new to the Texans or at new positions, including four future cornerstones in the front seven (Connor Barwin, Brooks Reed, Brian Cushing, J.J. Watt) who are all 25 or younger. So it all sounds good, right? Well, in the eternal Charlie Brown versus Lucy struggle that is Texans fandom, the league-wide trends since 2003 actually favor Lucy in all of this. Teams that burst onto the scene, going from sub .500 to double-digit wins in one season like the Texans did in 2011 (and 49ers and Lions, if you're keeping score at home), generally backslide the following year -- 89.6 percent of the time since 2003, to be exact. This year's Houston Press Texans preview examines that trend and the reasons why (or why not) the Texans are immune/susceptible to a backslide in 2012. The preseason will end on Thursday night, and by Monday the Texans will have chosen the 53 guys with whom they plan to go battle-fight this season. And Texan fans everywhere will go to battle-fight with them, the smart ones doing so cautiously. Knowing alcohol will be a huge part of any Texans coping mechanism this season, we are also providing you with an exciting new BINGO drinking game to play while you follow along with the Texans on television, the radio, or at Reliant Stadium (There's a little something for everybody in this one!). It's called "Road To New Orleans: BATTLE-DRINK The Texans Season." So let's get ready to battle, let's get ready to drink, let's get ready to BATTLE-DRINK! It's football time in Houston!